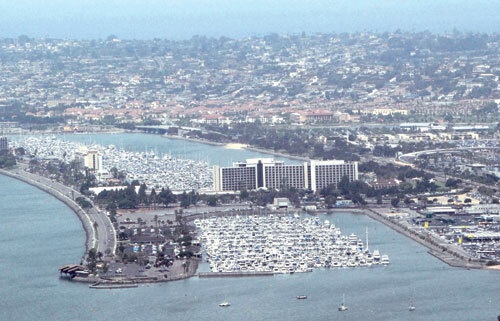 SAN DIEGO — The public can review the Environmental Impact Report (EIR) for the Port of San Diego’s proposed hotel construction project on Harbor Island during a 45-day review period that closes Aug. 26. The project consists of the redevelopment of a property located at 955 Harbor Island Drive and includes plans for construction of a four-story, 175-room hotel on the property leased to Sunroad Marina Partners LP. Additional redevelopment plans include the reconfiguration of paved area, realignment of a portion of East Harbor Island Drive and a reduction in the size of a traffic circle, and enhanced public access along the waterside of the proposed hotel. The project will also realign the existing sewer, water and utility lines, according to the Port of San Diego. In August 2012, the Board of Port Commissioners rescinded the June 2011 approval of the Final EIR and Port Master Plan Amendment to allow for further analysis of potential development. These new revisions provide that additional analysis, according to the port. The public has 45 days to review the document, which contains the new chapter that analyzes the potential hotel development associated with the proposed East Harbor Island Subarea Port Master Plan Amendment. Written comments can be submitted to the attention of the San Diego Unified Port District, Environmental Land Use Management, P.O. Box 120488, San Diego 92112-0488. Questions may be directed to the Environmental and Land Use Management Department at (619) 686-6283.